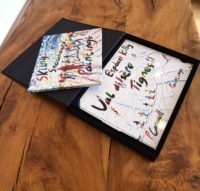 If you are a keen skier or boarder then these ski and snowboarding books make an ideal gift and add a touch of colour and glamour to your coffee table. There are a few snippets of skiing & boarding stories to go along with some of the paintings as well. I get a lot of people contacting me asking for help choosing a print or an original for their skiing / snowboarding friend which can be great fun and 99% of the time I get it right. These new books particularly the luxury book and the larger book of paintings below can make a great gift and take all the headache out of choosing the right print. 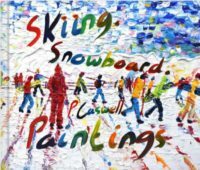 Large hardback Paintings book of Pete’s skiing and snowboarding paintings from all your favourite ski resorts 52 pages 33 x 28cm (13″x 11″) approx £75 + postage/packing(£8). Preview and buy the book on the publisher’s website. These large photo books make excellent gifts for ski / snowboarding addicts or add a splash of alpine excitement to your coffee table. I have also made this book in 2 smaller sizes to suite smaller budgets. There is the hardback book roughly A4 size or 21 x 26cm, 52 pages approx, £24, and a soft back, super budget book at £16 + post/packing £8. You can preview and buy the smaller book here on the publisher’s website, then select the book you want and order. The big book isn’t cheap, but they are just expensive to print that size in small print runs and I sell them at close to cost. If you can afford it I would go for the hard back book and if your budget stretches then the larger book is more impressive. The books take about 2 weeks to print and ship. These are the new range of books I am producing based on my favourite ski areas around the world. They are more luxurious than the Skiing and Snowboarding Book above, but also more expensive. They are very slightly larger (38 x 29cm), have lay flat bindings and heavy weight photographic paper (300gsm instead of 180gsm). The images are produced with a photographic technique instead of printed. 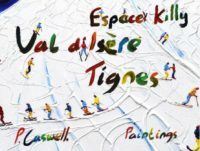 This series of books are based on the paintings of each specific ski area and look in detail at some of the paintings close up to see all the textures and brush strokes which make up each work of art. Some of these books have text in, some don’t, but generally this series has less talk and more paintings than the previous series. Each painting dose have a small annotations to say where each painting is from. You can also order a presentation box to add that extra special impression if this is for a gift. Next Book in the publishing workshop is the Verbier and 4 Vallees Paintings book which is about 4 weeks away from completion. Painting & Poetry books from the early days. Some of my older books can be purchased on Amazon.com or Amazon.co.uk or from the links for each book below. If you want a bit of history or your are interested in spiritual poetry then take a look at these books. Back in 2004 to 2007 I spent a lot of time in India and the paintings and spiritual poems reflect this. They are all in soft back full colour and cost approx. £15. (Left) Pete’s new painting book of all his most popular paintings up to winter 2008. Full size colour prints of paintings of 8 x 10 inches. Click on book to purchase from Pete’s shop on Amazon. Pete has been writing his beautiful poetry books adorned with his wonderful colourful paintings since 2005. They make a great gift for people who love art, wonderful, colourful and uplifting adding another dimension to the paintings. Crack your mind with this inspiring book.A truly beautiful and inspiring book, challenging the dominance and hypocrisy of our mind centred world, prompting us to live more in the heart and trust our intuition. As we move from our mind to our heart we learn to live in the present and let go of old patterns and fears to embrace life. Beautiful vibrant colourful paintings by the author illuminate the pages. Riddles of life, mind and soul reminiscent of Rumi’s poems and Lao Tzu’s Tao Te Ching’s texts inspire the reader. Pete has been a professional photographer since the 1980’s selling his photographs of his travels and books around the world. 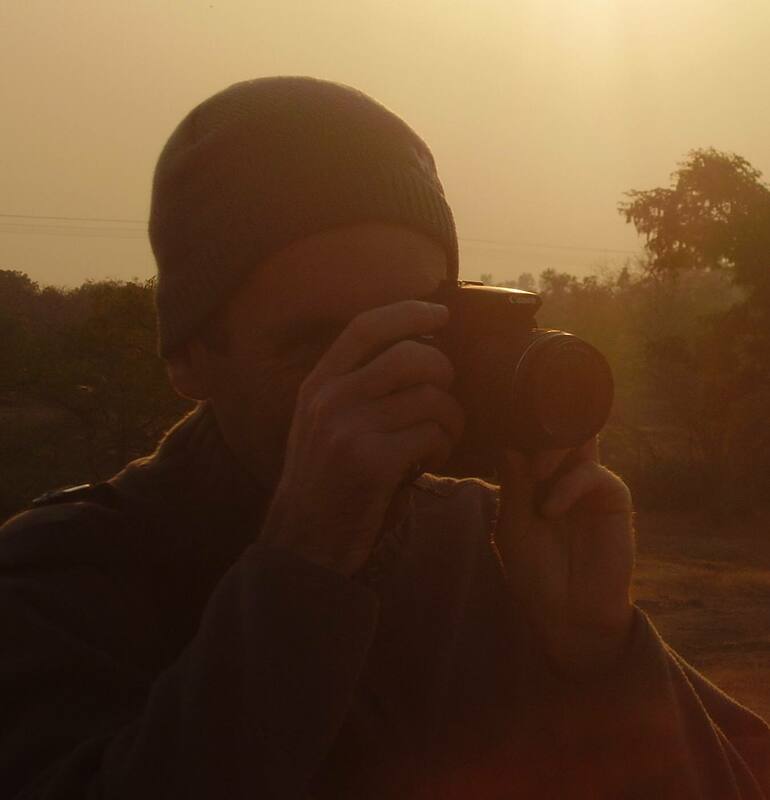 Pete on a photography assignment in India. Pete Caswell Prints For Sale.